Glucosamine sulfate is a chemical found in the fluid within your joints. Glucosamine supplements are often taken to help manage arthritis, treat glaucoma and aid weight loss. Glucosamine can be taken alone or mixed with a variety of other ingredients. Like all supplements, glucosamine should only be used under medical supervision, as it can cause side effects and interact with other medications being taken. Those who have or are at risk for diabetes need to use caution, as glucosamine can affect blood sugar levels. The glucosamine that your body produces helps with the growth, repair and maintenance of the cartilage found within your joints. Glucosamine allows your cartilage to absorb water, which keeps your joints lubricated. Supplements are made with the glucosamine found in the shells of shrimp, lobster and crab, says the Arthritis Foundation. It is often used to help manage the symptoms of osteoarthritis, which is a wearing away of the cartilage, but much more research is needed to determine how effective it is. If you have or are at risk for diabetes, you need to carefully monitor your body's response to everything you eat and drink, including supplements. 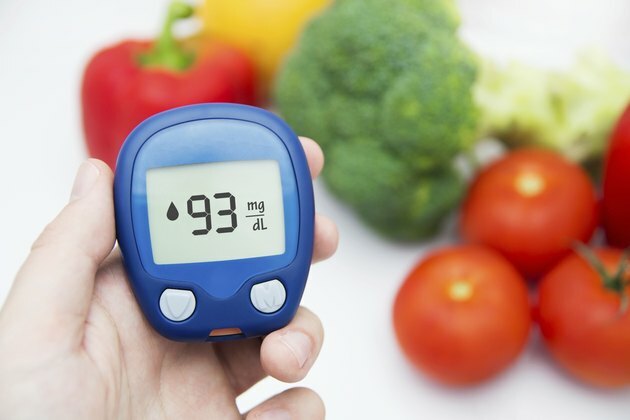 The exact effects of glucosamine on blood sugar levels are still unclear, but in some patients, it can alter blood glucose levels. Glucosamine does not appear to have an effect on blood sugar levels when it is taken orally, but if it is injected, your body might become less sensitive to or unable to properly use insulin. Because each case is different, it is important to speak with a physician before using glucosamine and to test your blood sugar levels regularly to see what effect the glucosamine is having on your blood glucose levels. If taking glucosamine makes your body less sensitive to insulin, your blood sugar levels might get too high. However, elevated blood sugar levels are a rare side effect because when glucosamine is taken orally, most of it is broken down within the stomach and digestive tract, notes the American Diabetes Association. However, glucosamine can be mixed with many other substances that might or might not affect blood sugar levels, so it is important to read the supplement label and know what ingredients it contains. Some patients taking glucosamine might require changing the dose of any diabetes medications they are taking. Symptoms of high blood sugar levels, or hyperglycemia, include frequent urination, increased thirst, increased hunger, dizziness, fatigue and weight loss. Glucosamine is considered generally safe and when managing osteoarthritis, a general recommendation is to take 500 mg of glucosamine sulfate or hydrochloride three times a day for 30 to 90 days, according to the University of Maryland Medical Center. You can also take one daily dose of 1.5 g. While rare, side effects can include upset stomach, heartburn, indigestion, gas, bloating and diarrhea, which might be alleviated by taking glucosamine with food.